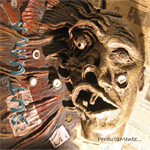 I didn't know quite what to expect from looking at the creepy cover art when I received Sutuana's 'PerdutaMente.' The promo page declared that Sutuana is an Italian hard rock band, and that for the most part, is dead on, at least until you listen. Then you discover that this talented four piece fluidly moves between styles of hard rock and heavy metal to earn a progressive label. I don't want to call the music eclectic because 'PerdutaMente' does have the underlying melodic hard rock theme, but Sutuana blurs the categories; and that is a good thing..
To begin, of the 14 tracks here only three are sung in English, and I do not know Italian (except for Sophia Loren). However, the vocals are lucid, strong and well arranged. You'll find some odd overtones to modern vocals on 'Faith' where Sutuana invokes near death/metalcore vocals without the screamo; despite this the song is quite good. The most promising attributes I found on 'PerdutaMente' came from several sources. The guitar work is excellent, original, and varied throughout ranging from hard rock as on 'Urio' and near metal as on 'Faith' and 'Roccia.' Probably even better is the fine bass work from Marco Niccoli; he often steals the show as on 'Sembria Facile,' 'Il Mietitore' or 'Pain Hymn.' Overall, however, I would say that all members of Sutuana are richly talented. For the scope of musical style, many songs border on heavy metal. For example, 'Roccia,' 'Faith (No More),' and the excellent cover of Deep Purple's 'Hush' have strong metal overtones coming mostly from the guitar work, but also the rhythm section. 'Non Son Torpore X Non Pensar' even comes in as more Black Sabbath style doom metal. For strict melodic hard rock, the most identifiable and accessible song is 'PerdutaMente Sola' which is well-paced and catchy. Yet, throughout "PerdutaMente' I could not help to notice the rich and diverse arrangements that put many of the above songs and practically the entire album in the realm of progressive heavy rock. 'Roccia' and 'Sembra Facile' is easily drift towards this category. However, there are some down times on this disc: songs like 'Il Mietitore' and 'Mandami Una Cartolina' are average pieces that are only saved by individual performances, the bass on the former, and the guitar on the latter. Sutuana's 'PerdutaMente' is a different and enjoyable work of melodic hard rock. With the metal and progressive overtones, the listener will be pleasantly challenged by the depth and breadth of Sutuana's skill and craftsmanship. Recommended. Sutuana's 'PerdutaMente' is a different and enjoyable work of melodic hard rock. With the metal and progressive overtones, the listener will be pleasantly challenged by the depth and breadth of Sutuana's skill and craftsmanship.